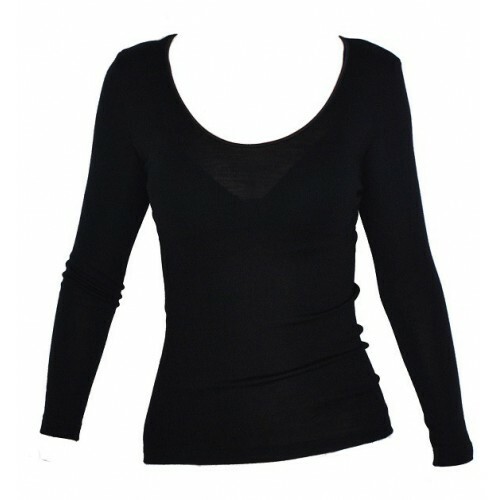 Ladies' shirt long sleeved with a low round neck of 85% wool and 15% silk, colour black. By buying this product you can collect up to 9 Stars. Your cart will total 9 Stars that can be converted into a voucher of € 0,90. Check for this "My Loyalty Points" in your customer account. Ladies' shirt long sleeved with a low round neck of 85% wool and 15% silk, colour black. Finally we found a shirt with a real low neck again, to fit under all your clothes. 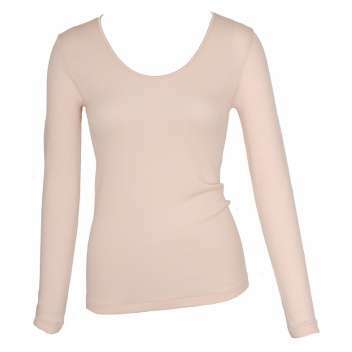 The neck has an elastic trimming; it is a basic every day shirt to keep you warm and comfortable. The length of the arms is about 7/8 so they don't show when you wear it under your clothes. If you want to see a sizing table for this brand, click "download" on the left side.